In 1352, the first official statutes of the College of St George required the Warden [Dean] and Canons of Windsor to have a common seal. 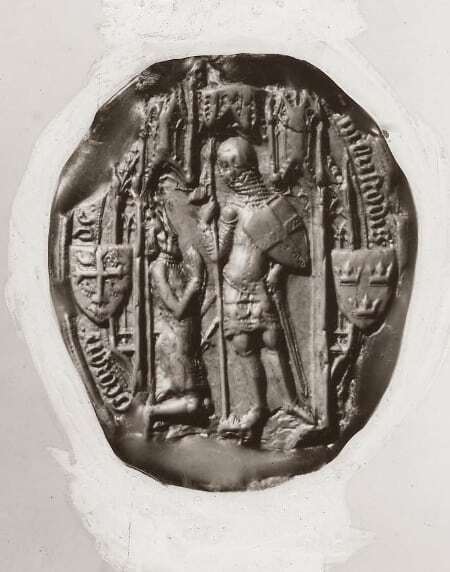 A seal (an impression made in wax from the engraved seal matrix) was to be applied to documents in which the Dean and Canons acted as a corporate body, for example in land and property transactions. Statute 43 specified that “It shall not be lawful for the Warden of the same College or any other person whatsoever to oblige or bind in anywise the said College to any contract made by them unless the aforesaid seal shall have been affixed thereto”. In order to prevent unauthorised use of the seal matrix, it was to be placed with the College archives in a coffer or chest secured with three different locks and keys, the three different keys being held by the Warden, Canon Precentor and Canon Treasurer, “so that one person shall never have in his custody two or all of the aforesaid keys at the same time”. The earliest known impression of the St George’s first common seal may be found on a document dating from 1356 in The National Archives [TNA E 42/479]. A photograph of this seal, taken in the 1950s, features as October’s ‘Image of the month’ [SGC PH DOC.1]; whilst a cast of the same seal is held by the Society of Antiquaries. St George’s Chapel Archives has only one (imperfect) example of the first common seal: a fragment on a release of 1446 (SGC XV.55.25). The design features the founder of the College, Edward III, bearded, crowned and dressed in full armour, kneeling before St George, one of the College’s three patron saints. St George, also clad in full armour, bears a shield on his left arm, embellished with the St George cross, and holds in his right hand a St George cross pennant attached to a lance. The two figures are portrayed under an architectural canopy featuring three Gothic arches. They are flanked by two shields of arms: the arms posthumously attributed to two royal English saints – St Edward the Confessor (a cross patonce between five martlets) and St Edmund the Martyr (three crowns). St Edmund the Confessor was one of the College’s other patron saints (the third being The Blessed Virgin Mary), but the reason for the inclusion of St Edmund’s arms is unclear. The legend on the seal is incomplete because of wax loss. However, an undated engraving held in the St George’s Chapel Archives [SGC F.43] suggests that it originally read: [Sigillu]m: Custodis: [et: Collegii:] Sancti Georgii: de: W[yndsore] – the seal of the Warden and College of St George, Windsor. The engraving also indicates that a royal coat of arms was included at the bottom of the seal. By 1561, the first common seal had been replaced by a second version, featuring St George and the Madonna and Child in a double-pillared niche under a fluted architectural canopy (tympanum). The Tudor royal arms surrounded by the Garter were included under the niche. This seal matrix was lost in the Commonwealth, when the Dean and Canons were ejected from Windsor Castle, and was replaced in 1660. Over the years the use of the common seal declined as the College’s smaller seal ‘ad causus’, originally used on less formal occasions, came to be used for all corporate legal transactions. In 1660 the seal ‘ad causus’ had to be replaced along with the common seal: the 1660 seal matrix is still in use today, stored in a safe secured with several locks.